Learning about kitten weaning and knowing how and when to move new born kitties onto solid kitten food, is something many cat owners worry about. On this page, you will find useful tips and advice about this important part of providing good kitten care. When is the right time for weaning kittens? Queens (mother cats) can produce milk for up to 12 weeks and her kittens may still nurse from her until that time. However from the age of about 5 weeks old they may start to take notice of their mothers own food and indeed some mother cats may encourage them to eat it instead of nursing. So as an owner, you should be prepared to start weaning kittens from around week five. This is also true if you are hand rearing kittens. Kitten weaning should be done gradually. Do not expect them to take to eating solid food all the time straight away. They will still need cat milk (or a substitute if hand rearing) up to week 12. Hold a piece of the kitten food to their lips to allow them to smell it. Then push a little of the food into their mouths. Once they are used to eating from a plate, you can leave some food on a plate in their enclosures all the time so that they can eat when they wish.Eventually they will stop nursing from their mothers and only eat from the plate. If hand rearing, you will have to monitor how much solid kitten food they are eating and gradually reduce their milk accordingly. Kitten Weaning - What Solid Food Should I Feed? Basically the smellier the better as this will encourage them to eat it. Although you can buy and cook your own meat at home for kittens, which they will love, it will not provide all their nutritional requirements and so should not be the only type of food given when kitten weaning onto solid food. It is best to feed some high quality specially prepared kitten food such as Wellness Grain-Free Canned Kitten Food which will have been specially prepared to contain all the kittens nutritional requirements and moisture . Contains higher protein, nutrients, fat & calories to meet the needs of actively growing kittens. Made with chicken, fruits & vegetables. You can feed wet and dry food to your kitten but it is best to soak the dry food in water before serving, as their teeth and digestive system may not be able to cope with dry food for a while. A mixture of both wet and dry food will work out cheaper for you as a lot of wet kitten food is made with a high content of water (required by kittens). This will increase the protein quantity in the food but will not be harmful. Your kitten will also find the mix more palatable than just dry food alone. 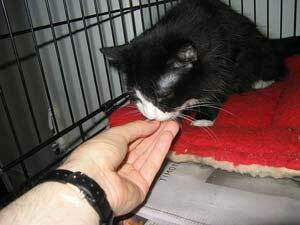 When weaning kittens, offer solid food every six to eight hours. Always remove any uneaten food so that it does not spoil and to also reduce the chances of over feeding. How Do You Know If Your Kitten Is Eating Enough? The kitten should clean up their plate within 30 minutes. Leftover food could mean that you are feeding too much so offer less next time. Remember kittens do not have very large stomachs. The kittens should be eager to eat at the next meal. If not then you could be feeding too much. Kittens should appear plump and should be very active. Kitten's stools (their poo or bowel movements) should be formed and not loose or watery like diarrhea.